I am always trying to get my five year old to expand her dietary horizons. One way I do this is by adding more adventurous foods to meals she already loves. Take, for example, her favorite supper, tacos. She loves the ritual of being able to make her own from the ingredients set out on the dinner table. Avocado, grated cheese, and plain yogurt are “safe” ingredients for her – things she will always eat – but I like to add a little something extra to encourage her to try new things. 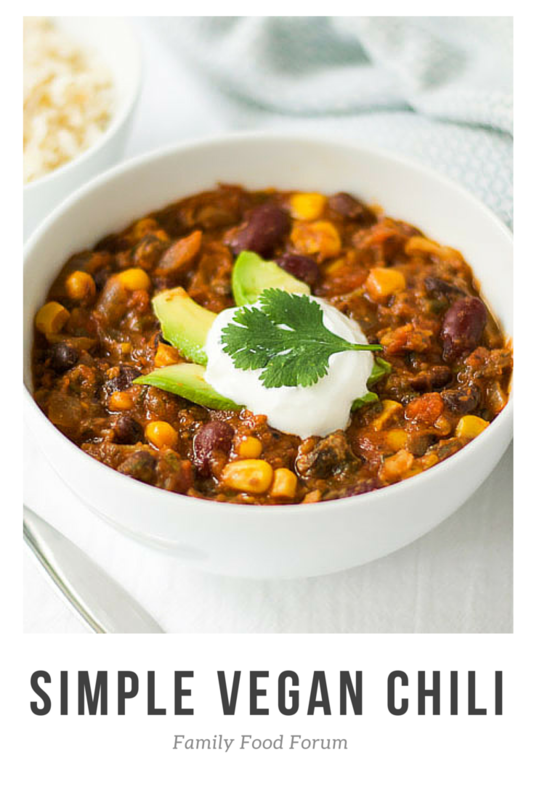 This simple vegan chili was my latest attempt. 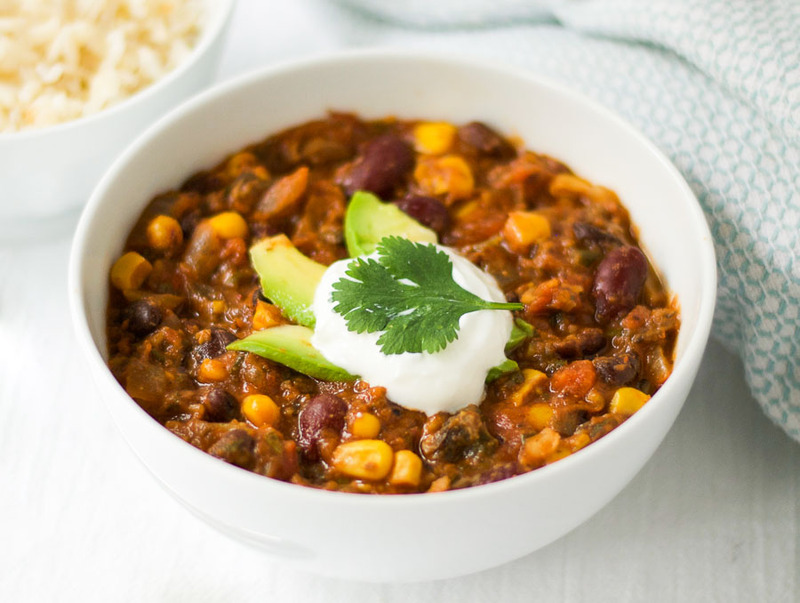 Unlike some heavy, meat-based chilis that are best reserved for cold winter nights, this lighter vegan version can be eaten all year round. You can pair it with brown rice in a bowl, or dollop it onto tortillas for taco night. Its spice level is entirely customizable. If you prefer a very mild chili, skip the cayenne pepper entirely. If, on the other hand, you like a little more heat, add 1/2 tsp instead of the 1/4 suggested in the recipe. Not only is this recipe delicious, but it is a nutrition powerhouse. One serving contains more than 100% of a woman’s and 70% of a man’s daily fiber needs. In addition, it provides more than 50% of your daily vitamin A and calcium needs, almost 75% of your daily vitamin C needs, and a whopping 85% of your daily iron needs. 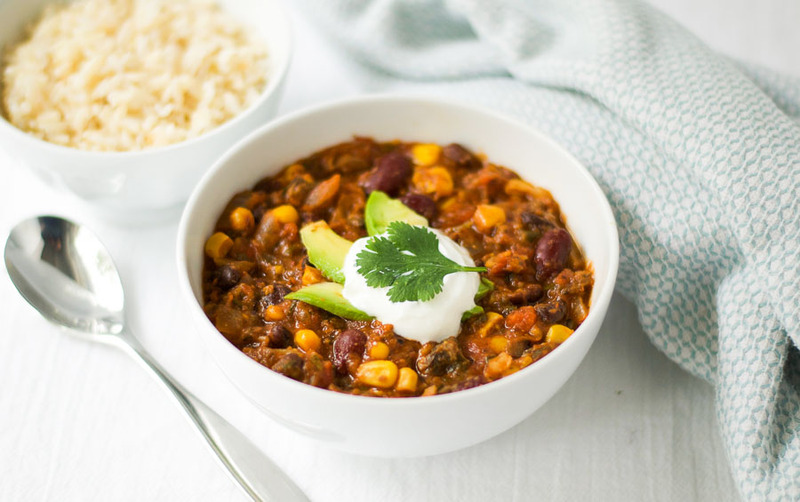 The other great thing about this simple vegan chili is that it freezes really well. Just put it into a freezer bag or container and store for up to 3 months. Then, when you find yourself in a pinch with no dinner plan, you can pull it out of the freezer for a quick, delicious, and healthy dinner. 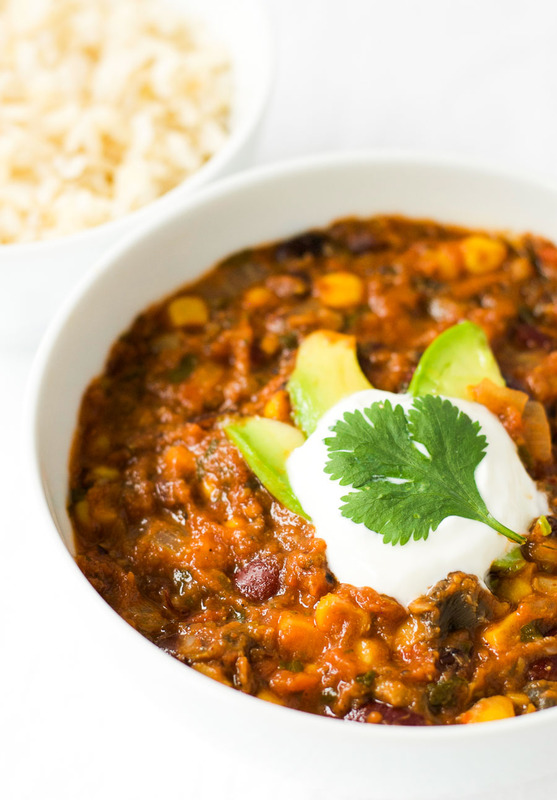 This vegan bean chili is easy to prepare, delicious, and healthy. Heat the olive oil in a large pan or dutch oven over a medium heat. Add the onion and cook for 4 minutes, stirring occasionally. Add the garlic and mushrooms and cook for a further 5 minutes. Add the chili powder, cumin, coriander, cayenne pepper (if using), and tomato paste, and cook for 2 minutes, stirring continuously. Add the salt, pepper, oregano, sugar, kidney beans, black beans, tomatoes, corn, and water. Stir, cover, and simmer for 15 minutes (or longer depending on how much time you have). Add the fresh cilantro, adjust seasonings as necessary, and serve. This looks like a super recipe-great idea! This looks delicious! I am always looking for interesting meat-free alternatives. I will give it a try. I like using gluten-free brown rice wraps to make burritos. This chili will be perfect.